Sometimes in the late evening I read through the Well-Trained Mind Forums while my hubby is doing some work. I love all the curriculum discussions and the wonderful wisdom shared by some of the veteran homeschool moms there. The other day I saw a post about burnout. This poor mom had just finished a very challenging homeschool year and asked for ideas to help her rediscover the joy in homeschooling again. She was planning to have a little summer homeschool revival. Lots of great ideas were given to her as well as encouragement. But I did notice a theme among some of the other moms who chimed in to commiserate about their difficult homeschool years. This mom had just completed her 4th official year of homeschooling and that’s when the burnout surfaced. Of the several other moms who also complained of a lack of desire to continue, all professed to just completing their 4th homeschool year. 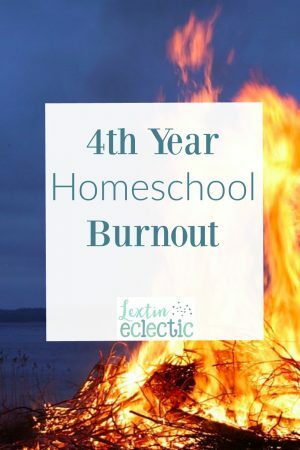 Confession: I had major homeschool burnout last year. I lost my homeschool “pizzazz” as one mom put it. I was right there in then same boat, bailing out water and wondering if I’m going to sink. Fact: Last year was my 4th “official” homeschool year as well. There has to be something about the 4th homeschool year that makes many moms want to give up. This is the year that a homeschool mom is thrilled to start her homeschool journey. She has made the decision, looked at curriculum, purchased books, and planned for her year. A new adventure is on the horizon and she is about to take the first step. The excitement is tempered by nervousness and fear. She wonders if she’ll do the right thing and if she’s chosen the right curriculum. She will doubt her choices routinely. Basically, the first year homeschool mom is completely bipolar – torn between the crazy excitement to begin the homeschool journey and the overwhelming fear of doing something wrong. This homeschool mom has 1 year under her belt and she’s feeling less timid in her choices. She has found things that worked well in her first year and things that did not work well at all. This year she is a more wise consumer and is able to make more informed choices about curriculum and schedules. She steps into her second year with more confidence and enthusiasm to try again and improve on any mistakes made in her first year. This mom is finding her groove with homeschooling. She has found curriculum that she enjoys and has experimented with a schedule that works. She has learned some important lessons through trial and error. Some of those are that there is no “right” way to homeschool and that her homeschool is unique. This gives her the confidence to choose what works best for her family. She is empowered and more comfortable with her homeschool decision. For some, this is the year that the homeschool mom begins to face burnout. This mom has found curriculum that works and she has purchased the next level of the programs that she enjoys. She has a routine and she is taking the next steps in her homeschool journey. There may not be as many changes and new curriculum choices in this year. Homeschool is no longer a new and exciting adventure; homeschool has simply become what she does every single day despite the complaints and bad attitudes of her children. At least, this is how the progression was for me in my homeschool journey. Once I hit the fourth year I was in a predictable routine. I moved through each day and saw significant progress but I had lost the joy and excitement of homeschooling. The newness of our homeschool journey wore off and I hit the phase where everything felt like hard work. I officially experienced 4th year homeschool burnout. I have no idea what year 5 will bring but I was getting a little worried. I wondered what the next phase would be like in our homeschool….So far things are going more smoothly. I had made a plan to better equip myself over the summer, knowing that homeschooling now feels more like a chore than a privilege. I planned a little homeschool summer revival (podcasts, webinars, encouraging books, homeschool conventions) to help find my pizzazz for another homeschool year. And I do think it has helped me! I've been following your blog for a couple of years now and want to thank you for always keeping it real! We are in our 4th year this year as well. I really appreciate this post and can totally relate! You're welcome! I try to be honest about our homeschool successes and struggles. Homeschooling is such a blessing but it can be so, so challenging. I feel like we barely survived our 4th year. I took some time over the summer to try to refresh a little bit and this year is better so far. Even at the beginning of last year I had simply lost my motivation. Now that I'm in my 5th year I'm seeing a lot of progress and seeing the "light at the end of the tunnel" with my oldest who is able to help more. So it is getting better. But now middle school looms ahead and that terrifies me!